Kitchen trends come and go, but there’s no denying that neutral-colored cabinets can always stand the test of time. 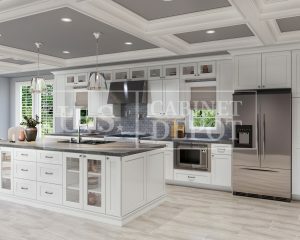 Since the early days of cabinet manufacturing, white cabinetry has been at the top of the charts when it comes to cabinet sales- and for good reason. Read on to learn why white, gray, cream and other neutral cabinet colors are always in! Neutral cabinets can create a space that feels open and inviting. They can make a small kitchen seem more spacious and a dimly-lit kitchen feel bright and airy. White has always been associated with cleanliness and purity. Color therapists suggest that bright colors represent happiness and innocence. A light cabinet color can produce this welcoming and positive vibe in any kitchen or bathroom. It’s best to keep in mind that dirt can never hide in a kitchen with light-colored cabinets. However, when the cabinets are well-maintained, they can easily brighten up the room and offer a charming, classic look. Neutral cabinet colors are anything but stark and boring when paired with the right décor. You can achieve almost any style when designing with neutral-colored cabinets. The lighter finish will work well with nearly any paint color, countertop and backsplash. Whether you are going for a traditional, modern, or even vintage country style, you can pull it off using a neutral cabinet color. Just add the right accessories and hardware to complete the look. Whites, grays and creams are so easy to work with because they leave you unrestricted in terms of the complementary textures and finishes you can use. Go bold with a bright yellow wall color or add accents of deep blue. Or you can downplay the colors and patterns to stick with a crisp, clean look by using white counters and a classic subway tile backsplash. A neutral cabinet is perfect for the homeowner who frequently updates the look of their space, but prefers to do so at a low price. You can achieve a whole new look in a cost-effective way by simply adding a fresh coat of paint, replacing the backsplash, or swapping out the fixtures and decorations. These seemingly small changes can make a huge difference in a kitchen or bathroom with neutral cabinets. The space can look refreshed and new in a cheap and timely manner without having to replace the cabinetry each time the homeowner feels the need to change things up to match the current season or trend. Neutral-colored cabinets continue to dominate the market. Despite the recent interest in bolder and darker color schemes, time has shown that whites, light grays and creams will never go out of style. Neutrals offer a timeless look that is a great foundation for a wide assortment of other colors and textures. Although white cabinets are a classic look, it’s important to remember that they can end up feeling cold and stark in a bright space that has not been properly decorated. Aside from adding the right accessories, you can also add warmth by opting for light gray or beige cabinets. Off-white cabinet colors have proven to uphold their value over time nearly as well as the standard white. All homeowners know that it just makes sense to spend only what they can recover when it comes time for resale, so it’s imperative to find ways to maximize their profit during a remodel. The flexibility and practicality of neutral cabinets makes them a smart move for any homeowner who is considering resale. 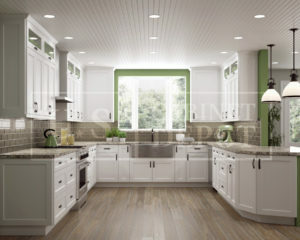 There is no risk involved with choosing light or white cabinets because they have been a top seller for decades. Unlike other current trends, there is no decrease in popularity projected for the future.